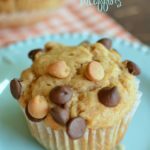 I fell in love with the texture of these Chocolate Chip Banana Muffins at first bite! And who can resist chocolaty goodness first thing in the morning? 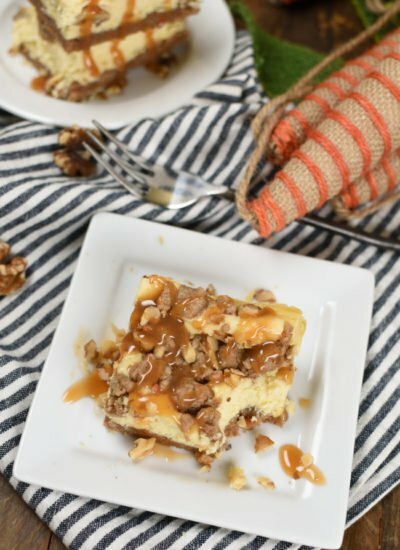 If you have followed my blog in the past you know why I’m always posting banana recipes on my blog even though I don’t like bananas at all. If you haven’t been following my blog, I wish you would start! 🙂 I’ll catch you up to speed and tell you why I make banana “stuff” even though I don’t like bananas. When I go to the grocery store I rarely buy bananas because I don’t like them, and because they always end up over ripe and then I have to find a way to use them up. Whenever my kids, or the big boss of this farm, go to the grocery store they load the cart up with bananas. The bananas always get over ripe and I’m back to taking care of the problem. 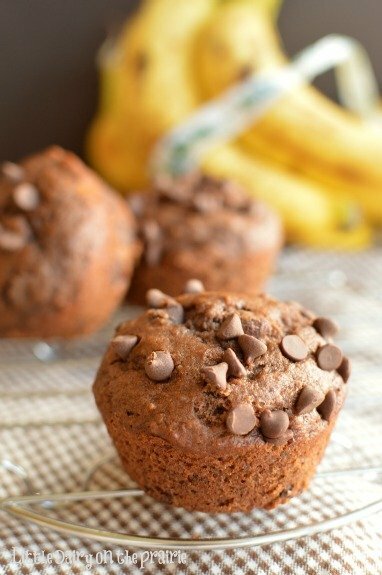 Trust me, these Chocolate Chip Banana Muffins are no problem. Let’s face it chocolate chips will fix about any problem you have. If your kid can’t remember their math facts, bribe them with chocolate chip for every correct answer. If they won’t eat their oatmeal for breakfast, add a few chocolate chips, they will start lapping it up like a dog! Hopefully your kids have better manners than mine and don’t eat like a dog. Anyway, you get the idea. 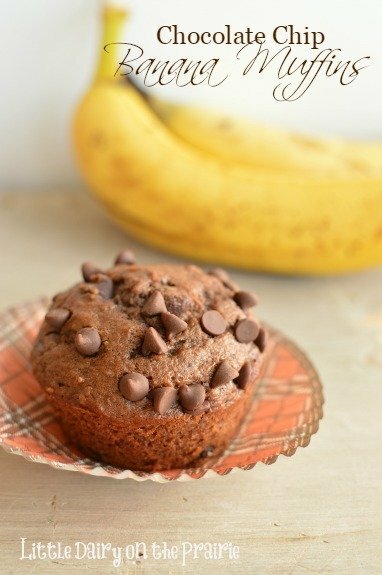 Chocolate chips added to already chocolate banana muffins made the overripe bananas seem like a treasure. Do you think my boys buy carts full of bananas and let them get ripe on purpose? I don’t know why that thought never crossed my mind until I was typing this post. I bet they do. They know if the bananas get ripe I will add chocolate chips, in some form, to them and the bananas will magically become some delicious food. I think they are beating me at my own chocolate chip game! 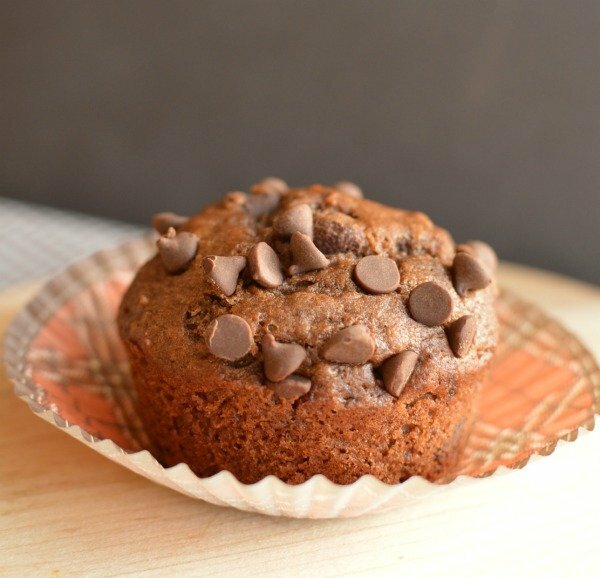 I haven’t even told you why Chocolate Chip Banana Muffins are so good other than they are loaded with chocolate chips. Really, what more do you need to know? I will say, I love, love, love, the texture of these muffins. I made them a few times because the first time I made them I thought they were a bit dry. The version I’m giving you is spot on, chocolate chips and all! Preheat oven to 375 degrees. Line a muffin tin with liners or spray with cooking spray. Mix oil and sugars together until combined. Add mashed eggs and vanilla. Mix. Add bananas and mix until combined. 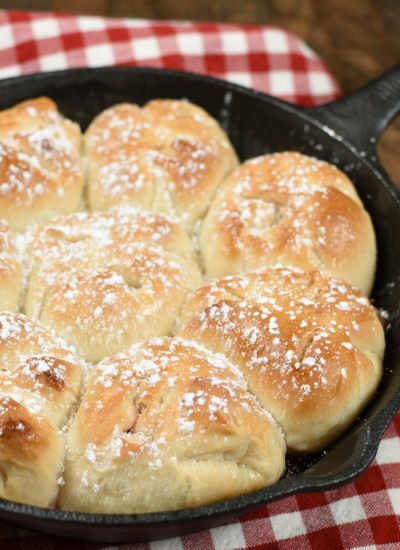 In a separate bowl, mix flour, cocoa, baking soda, baking powder, salt and cream of tarter together. Add it to the creamed mixture. Mix only until combined. 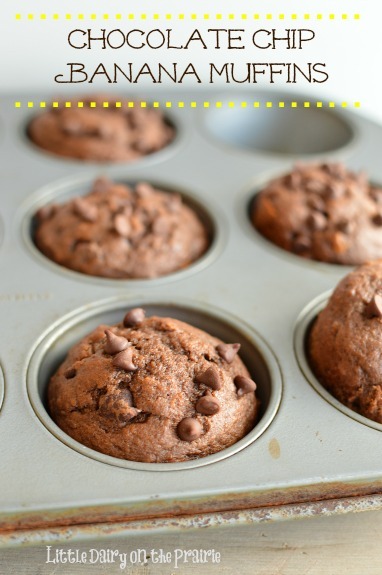 Reserve a few chocolate chips for sprinkling on top of muffins if desired. Add remaining chocolate chips to batter and fold in. Fill muffin cups ¾ of the way full. 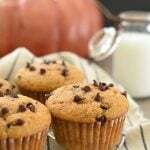 my family loves banana bread so i an going to have to give these muffins a try. Thanks for sharing. 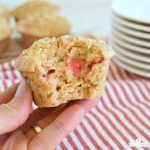 If your family loves banana bread they are going to love these muffins, Laura! 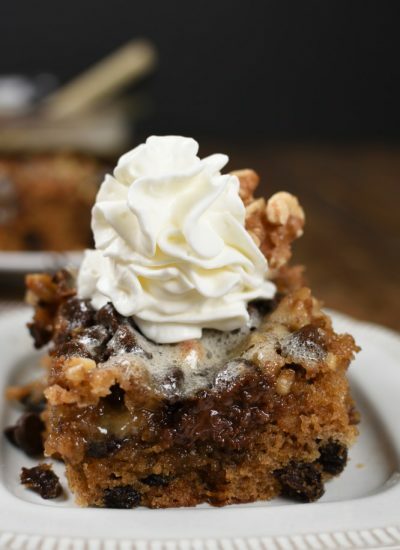 What’s not to love about bananas and chocolate? There is something so wholesome about a muffin! 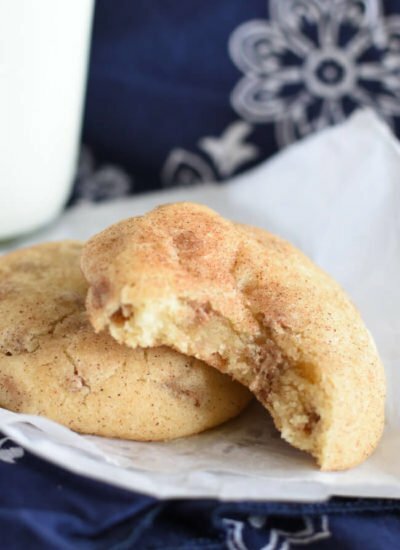 These will be great for my kids to grab on the way out the door! Yes! 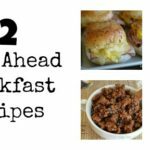 It seems like the older my kids get the more “on the go” breakfasts we need! These are perfect for handing to them!